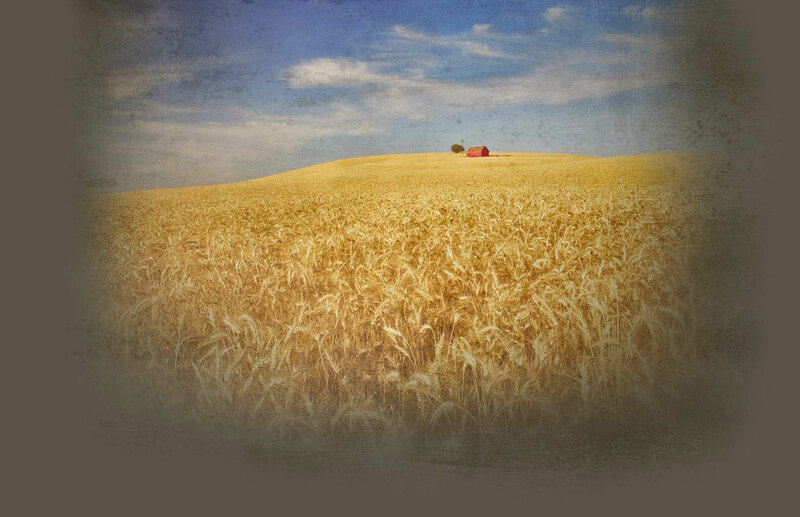 Our artisan-distilled spirits are made from USDA Certified Organic wheat, barley, triticale and corn grown especially for our distillery, and the quality of each of our products is a direct reflection of the superiority of our grains. 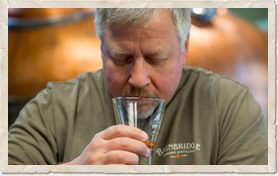 From the pristine waters of our island's deep aquifers, to the unspoiled, un-compromised Washington State farmlands on which our grains are cultivated, no effort is spared to create distilled spirits of a singular and elemental nature. This passion and dedication goes into each and every Small Batch we make. Bainbridge Yama starts its life as organic Alba and Full Pint organic barley grown in Washington state's Skagit Valley, and after mashing, fermenting and careful distillation in our Bainbridge Island stillhouse, completes its journey aging in small Japanese Mizunara Oak casks from Hokkaido, Japan, where it takes on all of the exotic influences to be found in this ultra-rare wood. Bainbridge Yama Mizunara Cask Single Grain Whiskey is the world's only non-Japanese whiskey to be aged exclusively in virgin Mizunara cooperage. It delivers bright aromatics of mango, vanilla, toasted sandalwood, tropical flowers, marzipan and star anise. Flavors open on nutmeg and clove, pear and toasty wood notes, settling out to honeyed vanilla and toasted marshmallow. Finish is warm and lingering with fading spice and a pleasant oak grip. We start with specially selecting barrels of Fully-matured and ready-to-bottle Battle Point Whiskey for finishing in casks that once held 10-12 year old single malt whisky from the Scottish isle of Islay. The whiskey is barrel-finished for a period of 8-12 months - enough time for the distillate to tame the barrelâ€™s smoky influence and to allow the wheat whiskey's character to assert itself. The flavors are full and intense, with notes of stone fruit, saddle leather, and wheat grain well integrated with the Islay smoke. Battle Point is the world's only Wheat Whiskey to be named the WORLD'S BEST WHEAT WHISKEY 3 times. JUDGED THE WORLD’S BEST VODKA from a field of more than 1000 competitors at the World Drinks Awards in London. 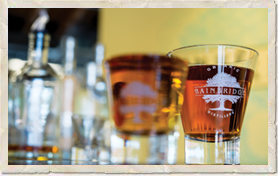 This oaked gin starts life as Bainbridge Heritage Organic Doug Fir Gin, but undergoes a unique infusion process, resting on hard-toasted virgin American oak chips for at least 2 months. Unlike barrel-aged gins whose flavor characteristics can be muddled by the residuals of the barrel's former contents, the use of virgin toasted oak ads a warming hint of tannin and ads dimension and detail to the flavor of the freshly-cut Douglas fir boughs used to make this spirit. A wet gin by definition, this American wheat gin features 10 organic botanicals including juniper, orris and angelica root, 2 types of citrus peel, whole licorice root, coriander, cardamom, fennel seed and Douglas fir, freshly harvested in northeastern Washington State a day prior to the final distilling of each small batch. The flavor is full and lush, without being harsh or astringent, with pronounced essences of juniper, licorice and cardamom with a heady evergreen fir aromatic. Our gin's unique green tint comes from the Douglas Fir, extracted from the needles by our still's Carter-Head inspired set up.